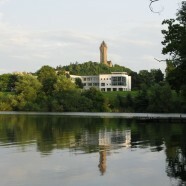 As previously mentioned on our social media feeds, there is a PhD position available at Stirling University entitled, ‘Out of this world! Sulfur cycling in Rio Tinto, Andalucia, Spain: an Earth analogue for extraterrestrial environments’. The Rio Tinto is an Acid Mine Drainage (AMD) system in southwestern Spain. Its characteristic red colour is derived from iron dissolved in its acidic waters. The area has been mined for metals since the Bronze Age. However, there is evidence that the river waters have been naturally acidic for at least two million years. Hence, Rio Tinto offers the unique opportunity to compare the influence of modern mining and toxic heavy metal pollution on the biogeochemical sulphur cycle and, in turn, the influence of microorganisms in sequestering toxic heavy metals in the form of sulphate and iron oxide minerals. Additional interest comes from the field of astrobiology: Rio Tinto’s extreme acidic environment serves as an analogue for potentially habitable environments on Mars and Jupiter’s icy moon Europa. In order to understand microbial sulphur cycling at Rio Tinto, we will investigate S and O isotopes in sulphates from modern and ancient sediments, as well as S, H, O and C isotopes on water samples. This full-time, four-year PhD is in partnership with the University of Glasgow and Universidad de Huelva in Spain. The deadline for applying is the 2nd of February 2015. Full details here (pdf).